Purposeful boats, and the Bluefin Scoundrel 5.00 is one of them, are handsome in their simplicity. An unadorned and unpainted centre console, it screams out its purpose as a fishing machine. It was exactly the kind of vessel its buyer wanted. It is destined to spend much of its life exploring the creeks of the Northern Territory in pursuit of Barramundi. He is such an enthusiastic fisherman that that he simplified it even more: he grudged space given over to non angling and so deleted the standard driver’s box seat. The dealer knew that anyone can get tired of standing and located one of the standard three sockets for portable swivels in the right place for a tired driver. Certainly, with box seat removed there is all the elbow and foot room three or four fishing friends could want or need. Most of this room is ahead of the console; with the absence of the box the owner was able to have it moved aft. The friends have a carpeted deck and raised bow platform – equipped with a decent set of rails – with room left over for eskies, tackle boxes and the like. Despite the absent box there is abundant dry stowage in lockers under the platform, within the console and below the transom bench seat. This last, with its side grab rails, ensures that the passengers at least do not have to stand or perch on the swivels. The owner did not want to waste fishing time on travel so specified the substantial power of a 100hp Honda. This gives electrifying acceleration to go with the required blistering speed, although with no suggestion of over powering. 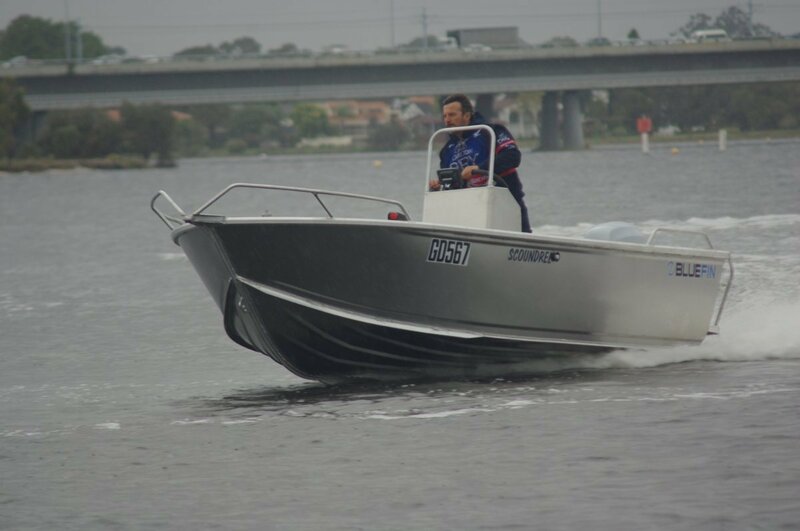 Opening the throttle from standstill causes little or no bow lift - the boat just gets on with the job of planing. A splash well is installed; less than full height, it allows complete tilting of the motor. At rest the Scoundrel is notably stable, with a hull form biased towards long periods of low or no speed. This is achieved not with punt like flatness aft but by pressing in modest deadrise and broad chines while retaining reasonable sharpness forward. The overall result is a hull well fitted for what a dedicated fisherman could ask of it. Although essentially a no frills boat, the Scoundrel comes with everything that really matters plus a bit; even a factory fitted electric-electronic kit. This includes a switch panel for the navigation lights, bilge pump and so on, plus a Lowrance colour sounder. A useful piece of hardware is the neatly executed mini bowsprit. Few things can reduce the pleasure of a day’s boating more than the prospect of retrieving onto an indifferent trailer. That will not be a factor in the life of the review boat. It sits on one of Dunbier’s top of the range single axle trailers. Designed for drive-on use, you have to do little more than poke the bow into its slot and roughly line the boat up – the Dunbier handles the rest of the alignment. For those unhappy with drive-on operations winching, while never a pleasure, is light weight work. Bluefin's Scoundrel range of fishing boats (the 5.00 is the range’s biggest) is a thoroughly developed series. The price of $37,500 can be lessened considerably by dropping horsepower from the review boat’s 100, and even more by selecting a two-stroke Tohatsu.